Where the Wild Things Are is a reimagining of a popular children’s story from my youth. Spike Jonze directed the fun, dramatic feature and enlisted his ex-girlfriend Karen O of Yeah Yeah Yeahs to pen its soundtrack. She exercised writing duties for all but two tracks, leaving room for a Daniel Johnston cover, as well as a short one-minute offering from known Coen Brothers and Spike Jonze composer Carter Burwell. Amongst the children followers of the film and soundtrack, she brought along some kids of her own. 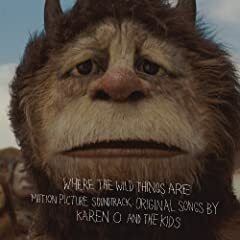 Karen O and the Kids are a group comprised of members of Yeah Yeah Yeahs, Deerhunter, the Dead Weather, Liars and the Raconteurs. Karen’s humming and innocent cries can be heard throughout, shared by young choir voices giving the listener an impression a child is behind it all, such as main character, Max, is in the story. “All Is Love” is the single presented during the final credit roll, though the first full song of the album. Providing a jangley, upbeat tune with acoustic guitars, piano, and overdubs from children is about as much (or more) glee one will find surrounding the somber story itself. “Worried Shoes,” the aforementioned Daniel Johnston cover, is my personal favorite—a moving number, backed mostly with subtle piano, it focuses primarily on the heartbreaking soul that is Karen’s voice. Fans of “Maps” or “Skeletons” by Yeah Yeah Yeahs will hear a familiar sorrow. Piano and acoustic guitar make up the bulk of the arrangements. They are complimented quite well with maracas, xylophone, the odd overdriven guitar inclusion, harmonica, and even synthesized drums at one point or another. By opting for an edgy female singer/songwriter (along with her clan of handpicked talent), listeners are left with an array of tracks far more favorable than a typical array of today’s hottest artists mixed along a big budget score. Wild Things is anything but typical—it actually has legitimate replay value—something that can’t be said for most soundtracks. Never trust a weasel. Support the artist and find out for yourself. Free album stream courtesy of Imeem.com. WestCoastWeasel.com encourages purchasing Where The Wild Things Are locally at Red Cat Records in Vancouver, B.C, any independant record store of your choice or online here.